The new family wanted a dream home with needed room to grow. The client had a vision of overlooking the St. Croix River Valley and setting the house into the pastoral sloping site. The couple desired a living room, dining room, and kitchen opening onto a large partially covered exterior deck. They also planned for a future infinity pool and wanted three upstairs bedrooms, including a master bedroom suite. 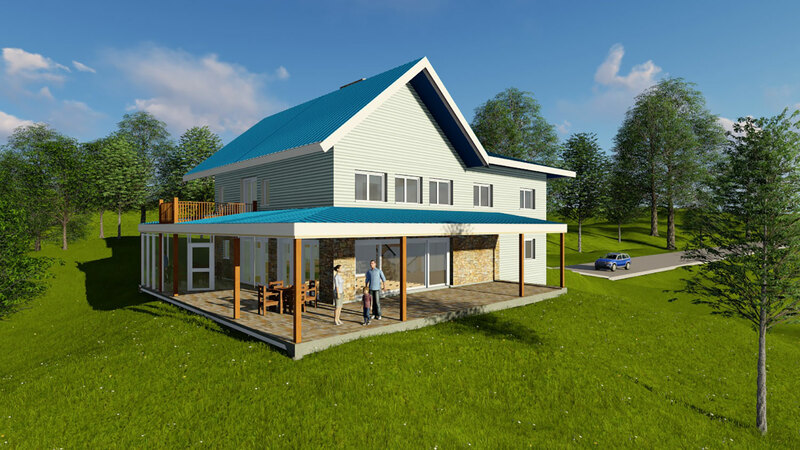 As working professionals in the renewable energy sector, they wanted a Net-Energy home, possibly to Passive House standards, with all electric appliances and utilities. The house is sited to set well on the land, maximize views and have excellent solar access. The 3,000 square foot home is two stories over a full basement with an attached 600 square foot garage and workroom. Ground floor features include a two-story living room space, a grand stair with a bridge to the kitchen, a 600 square foot deck wrapping the south and east corners of the residence, and a 100 square foot covered, screen-enclosed deck area on the east side of the residence. Second floor features are a master bedroom suite with an interior and exterior balcony, two bedrooms, a bath, and an interior balcony overlooking the living room and river valley. 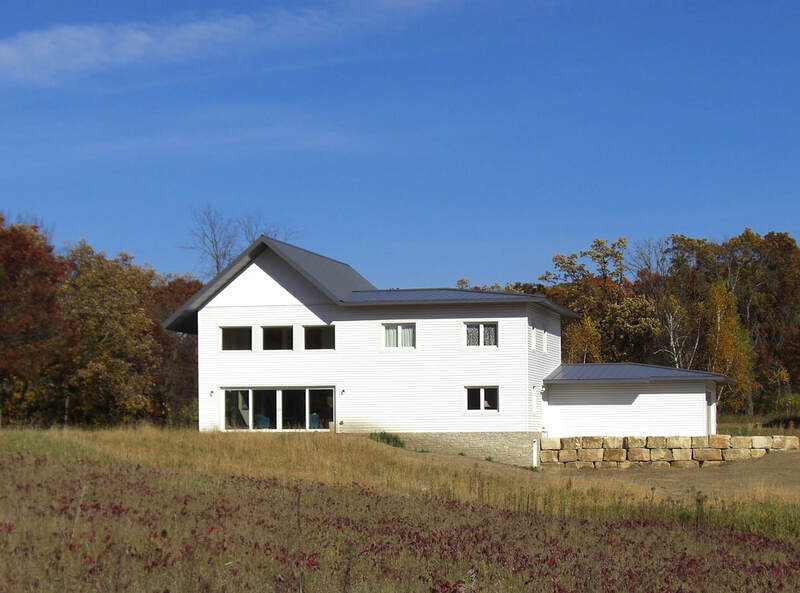 Insulated Concrete Form (ICF) construction were used on the thermal envelope portion of the house for thermal and storm resilience. The remaining construction is wood framed. Both the first and second story interior and exterior living areas of this new sustainable residence have dramatic views over the St. Croix River Valley. Interior spaces flow together simply and elegantly around the central grand stair and fireplace on the first floor. Second story spaces gather around a play and study gathering area that overlooks the first floor. The home was selected as a pilot project for the Passive House International – US | PHIUS Climate-Specific Metric program rollout. An on-site solar electric system on an adjacent barn will make the residence Net-Energy, creating more energy than it uses. The excess energy will be used to power the batteries of two future hybrid-electric cars for green living. 3,100 square feet are within thermal envelope, 800 square feet are outside thermal envelope. The workroom and garage are insulated for temporary heating. The home was designed for phased construction, with the living area within the thermal envelope built first. The garage and workroom outside the thermal envelope to follow.